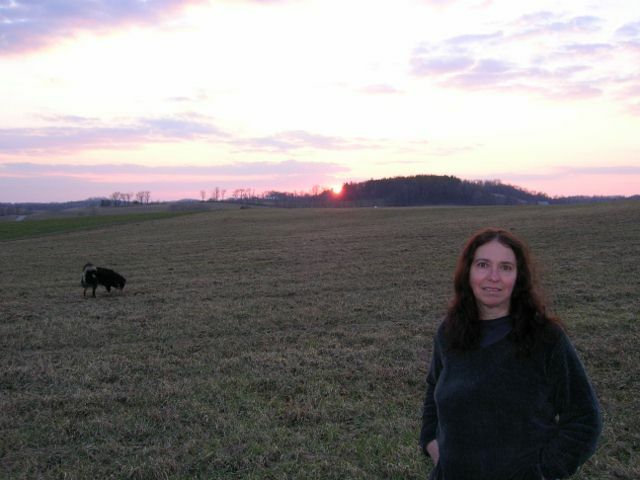 On May 12, 2012 my wife Lucinda’s remains (her ashes) will be laid to rest as protector of this organic farm and all its inhabitants – human, animal and plants – in perpetuity. Amidst the tearful and joyful celebration of the life she lived and left behind for all those who were privileged to know and love her, Lucinda will forever become part of this farm for which she cared. Two days before that – on May 10th – I will convene a press conference to declare this farm off-limits to unconventional drilling for gas in the Marcellus Shale that lies a mile below it. During the press conference I will make the first deposit of Lucinda’s ashes, saving the rest for the family gathering two days hence. With that deposit this land becomes sacred ground, held in trust by me and those who follow me as portion of the common wealth by which we are all sustained. Those gathered on that day will learn a new meaning of “surface rights.” The rights of all beings whose lives are sustained at the surface and depend upon the clear, clean water that runs upon and below it will be declared the inalienable rights by which human affairs are to be conducted. I will speak of the impermeable love of the land that is present just below our feet like an invisible barrier that no drilling rig can penetrate. “There is not a diamond bit hard enough to pierce this love for the creative Earth that sustains us, at least not here where I stand” I will say on that day. Any “property rights” that one person claims to destroy the good earth of Pennsylvania that belongs to no one because it belongs to all as part of the common wealth will be declared null and void. I will be inviting Pennsylvania Speaker of the House Sam Smith, State Senator Joe Scarnati (both my representatives in Harrisburg), as well as representatives of the oil companies active in this area and the owners of the gas “rights” to this property to come witness my declaration and to take some time to listen to stories of people who have been harmed by unconventional drilling for gas. Chairs behind the gathering point at the top of the beautiful hill that Lucinda so loved will be reserved with names of the invited guests on them. If they show up, they get to speak. That’s how they get to demonstrate the courage of their convictions, if they can. But the ground rule will be that they have to listen first, as Lucinda’s sister (her only sibling) speaks of Lucinda’s love for this land. They have to first hear about and from those who have been harmed by this drilling as their stories are told. If they do not show up, I will turn and ask the silence of each of their empty seats to speak for them. I will be asking various grassroots organizations to stand with me as we demonstrate for all to see that a people power movement is afoot to shut down these operations since the government in Harrisburg has decided not to protect us. My goats will be in attendance as potential new victims of drilling if I do not act to protect them. They make a pretty picture and they keep me focused on the responsibility given to me to protect their lives. The overall tone of the gathering will be focused on empathy for the human and animal beings who are suffering here in PA from this kind of drilling, and the many more who will surely suffer. That empathy for the victims will be offered as the “narrow gate” through which our adversaries may enter to receive our loving embrace of them as, we believe, our brothers and sisters in their hearts and souls. We will ask them to arise from their stupor and let their empathy move them beyond their corporate and political allegiances. We will declare that corporations are not persons, but are organizations inhabited by real human persons capable of change. So there you have it – a few ideas for fighting from where I live and love, and asking others to join me in that fight for an on-farm demonstration of resolve to resist the fracking, even as we appeal to the frackers and the legislators to leave the anonymity of their high corporate and governmental perches and become full human beings again. God bless, I would like to come but like you my wife and sole mate passed away on Jan 3, 2012 from Metastatic Brest Cancer. BTW we met In Trenton NJ at the DRBC rally in November, when you spoke. Thank you, Dave. I appreciate your comment and will hold your grief close in my prayers at Mass this Sunday. It is just a plague that we are all experiencing with cancer, one that will only get worse as we risk contaminating more and more of our environment for cheap energy via extreme means such as hydraulic fracturing. Lucinda will be with me on May 10, and thereafter. Every square inch of this ground speaks of beautiful moments between us since we moved here seven years ago. I hope that May 10 will be another one of those. Found your blog tonight and it brought me to tears. As hard as it must be for you to have lost your wife you are still fighting and using that anger and courage to change this world. Your words are powerful and your intention is potent. I am in Colorado but will be there in spirit on this day. Thank you for giving me hope. Thank you. It’s so good to know the fight is being carried on all across this country. Thanks for taking a stand. Your resolve will pay off! I send you my deepest regards concerning your loss and current drilling opposition!! Keep up the good fight! Stephen — You should invite Mark Ruffalo to participate when you have the press conference next month. http://www.waterdefense.org. Yes, I would like to come and be part of your stand for the land and water and for the loving memory of your wife, Lucinda and her guardianship of the land from harm and exploitation. Here in Gasland, Susquehanna County, Pa. and standing for the land and life with others. Vera Scroggins, Citizens for Clean Water. Thank you, Vera. I have heard of your efforts as well and I look forward to meeting you. I am so sorry for you loss and admire your courage as you continue to fight drilling even during a painful personal time. Your story and plans hit me particularly hard after a visit to Susquehanna County last week. I also heard on NPR that White House has regular meetings with “stakeholders,” i.e. the gas companies, and the people who are directly affected have no voice. Maybe the voices of the suffering be heard through your strong statement on May10th . I live in NY and probably cannot make it that day, but you are in my prayers. You are so eloquent. I heard you speak in Trenton last November and was naturally moved to tears. If I can’t make it to your farm for Lucinda’s celebration service I will hold you in my heart. Thank you for all you do for us all. Thank you, Donna. If you do make it, please make sure you introduce yourself to me. There are many of us from Pittsburgh planing to come and stand with you and support you. You are generous and courageous and I am grateful to know you. Thank you, Briget. There are some tough days ahead. Friends encourage. I always look forward to seeing you and all the Pittsburgh folks. Great, great peace upon you. Thank you for your conviction, strength, and depth of spirit. You are not alone; hope will be made manifest with your actions. Thank you. Gina. It will be a somber day, but it will be among good new friends. COME OUT AND SUPPORT STEPHEN!!! You and your family will be in my prayers that day. Living in Wyoming makes it to far for me to make it to this event of great importance. God be with you dear friend. Thank you, Dalene. After the event I will publish here the full press release and the invocations I will be making as my wife’s ashes are released. This is a minor insurrection, but hopefully one that will encourage others to resist. Stephen, I cannot be there today, but I stand with you in heartfelt solidarity. Your words moved me to tears, and I know what it is like to lose a spouse. Just dealing with that is tough beyond words. Thank you for your courage and your conviction to stand and be heard. Thank you for understanding that our precious Earth is alive and that we need Her to survive. I live in Westmoreland County, where the presence of rigs is becoming more commonplace, and along the shores of our public water source are the sites of unconventional gas drilling. I am with you in spirit. I am indebted to you and Lucinda for allowing me to photograph your loving, moving, tender and powerful ceremony on May 10. I try to use my photography to show the beauty that must be protected, and the human spirit that is stronger than any corporate polluter. The empty chairs reserved for the industry criminals and two of the many elected officials who support them, are shown as well, as are the chairs reserved for the couple who owns the mineral rights, and would poison your farm to fatten their bank account.